Manual Cinema’s Lula Del Ray is a strange and lovely dream, full of a far-off eerie sadness and sweet mystery, like some kind of apocalyptic lullaby. As delicate as a radio tuned just right to pick up distant 2 A.M. airwaves, the story pours forth in visuals like shadows bled out from a cinematically sliced-up storybook gloaming. It is essentially a coming-of-age story set in a mid-century American Southwest, but the titular adolescent figure resides ultimately in a field of timelessness—like that in which memories, or ghosts, reside. In the narrative, Lula lives in a trailer on the edge of a vast satellite field with her single mother who seems much too busy with apparently satellite-related work to pay Lula much mind. Lula spends her days wandering over, through, and under the satellite dishes scattered over the otherwise stark landscape. She draws aerospace diagrams and builds model-rockets. Posters of the Apollo 11 lunar crew adorn her bedroom wall. That is, until one day a televised program presented by the Gulf Oil Company breaks down in static and is dispersed by the televisual images and sounds of the Baden Brothers, an otherworldly duo whose music may be best described as ethereal country-western-melodic-synthabilly plus cello. Lula gets just a snippet before her mother rights the antennae, thereby summoning again the original Gulf-presented programming, but it is all that the girl needs to fully redirect her interests. She sends off for the vinyl, and posters of the Baden Brothers quickly replace the ones of the astronauts. Before long, Lula is running away to the big city to catch a special one-night only concert. What follows is too bittersweetly magical, too poetically intimate, for further discussion to do it justice here; one must simply experience it. Hyperbolic little blurbs are no uncommon thing in theatre programs and review sections, so it is worth affirming that it is no exaggeration to say that Lula Del Ray, and Manual Cinema in general, are wholly deserving of the highest praise they are given. 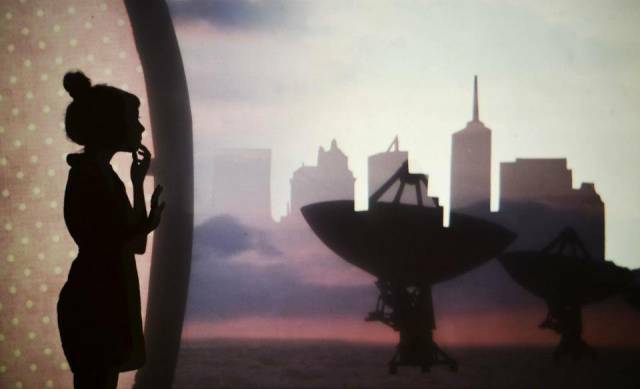 Lula Del Ray, as with Manual Cinema’s other productions, is a special sort of brew—a multimedia hybrid of shadow puppetry, cinematic arts, physical acting, living music… and that is simplifying it all a great deal. It involves old school projectors, two screens, silhouette modifiers, a plethora of puppets and transparent slide-things, computers for sound, musical instruments, and who knows what else. In short, there is a lot going on, and it all goes on very gracefully and, interestingly, in such a way that the audience is able to see all the inner workings—all of which are so harmonious, so fluid, that, far from detracting from the wizardry of it all, rather add a very enchanting element indeed. It is tempting here to begin listing off names and describing the contributions of each but that might take another couple pages. Suffice to say that every collaborator involved with Lula Del Rey is a conspirator in the construction of a haunting and deeply resonating world; a world that says, paradoxically perhaps, that beyond here lies nothing, and yet everything. Lula Del Ray is on at The Public through Jan. 14 as part of Under the Radar Festival.